I know Blaise Pascal from the secondary school science class. He wrote the famous Pascal Law of fluid pressure which is a hot topic in Physics examination. He was also a famous scientist, mathematician and philosopher of the 17th century in France. To my surprise, in a Christian gathering, I heard the pastor using Pascal as an example of faith. The main points conveyed were that, despite being a famous and successful scientist, he suddenly converted to Christianity; donated all his fortune to the church; and devoted himself to writing for Christianity. Pascal was well known for his philosophy, but not well known as a Catholic. I therefore tried to research into the truth of the historical events leading to such presentation. In France in the 17th century, all French would automatically be a Catholic. Pascal's second conversion came in 1654 after the death of his father and the decision of his sister to enter the convent. He went into a depression and fell seriously ill. Then he suddenly claimed to have had an intense religious vision. It was not sure if this was the result of a miracle or the illness. But Pascal then decided to go into religion. His fortune was inherited from his father. Actually, the majority of the estate was given to his sister Jacqueline, with Blaise Pascal as the conservator for his sister. When Jacqueline entered the convent, he had to give back the fortune by sending it to the church. He seemed to be deeply troubled by the Christian doctrine and tried very hard to justify the faith and belief by logic. The famous book Pensees was a collection of his thoughts. There was one part on the god gamble where he used the logic similar to the game theory to prove that believing in god's existence was the logical choice. This was later disputed by many philosophers. I also wrote such arguments in a blog article the God Gamble in 2008. With all these contributions, I wonder why he was not canonized by the Catholic church. There are two main reasons. 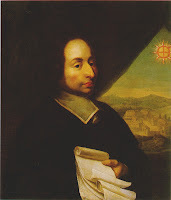 First, Blaise Pascal and his sister Jacqueline belonged to the Jansen Church. Jansenism was a branch of the Catholic Church which was in competition with the Jesuits. The Jesuits had the upper hand and the favour of the French king. In fact, King Louis VIV suppressed the Jansenist movement in 1661. So Blaise Pascal was in the wrong church at that time. He died in 1662. The second fatal mistake he committed was the attempt to justify Christian belief by logic and reason. The bible is full of contradictions and many deeds recorded are against the preached conduct. The method used by the church all along was to ask the followers to believe whatsoever; and called it the virtue of faith. It worked for many centuries until knowledge become widespread in the last few hundred years. Since then, there were continuous debates on religious belief. On the side of logic and reason, religion always fails. The present tactic is not to enter into any intellectual debate, claiming religion and science are in separate paradigms. However, the church has many learned persons. They only know too well the defects of religious thoughts. They could not help but contemplate the logical arguments in pain. Blaise Pascal is a good example. He wrote down his thoughts on a possible logical explanation of religious belief in secret. The work was incomplete. After his death, his writings were found in scrap notes which he hid away. Such notes were later assembled and published as the Pensees. You can imagine how the church reacts to such publication. Using Pascal as an example of faith is not a good choice.